The double-crested cormorant (Phalacrocorax auritus) is a member of the cormorant family of seabirds. It occurs along inland waterways as well as in coastal areas, and is widely distributed across North America, from the Aleutian Islands in Alaska down to Florida and Mexico. Measuring 70–90 cm (28–35 in) in length, it is an all-black bird which gains a small double crest of black and white feathers in breeding season. It has a bare patch of orange-yellow facial skin. Five subspecies are recognized. 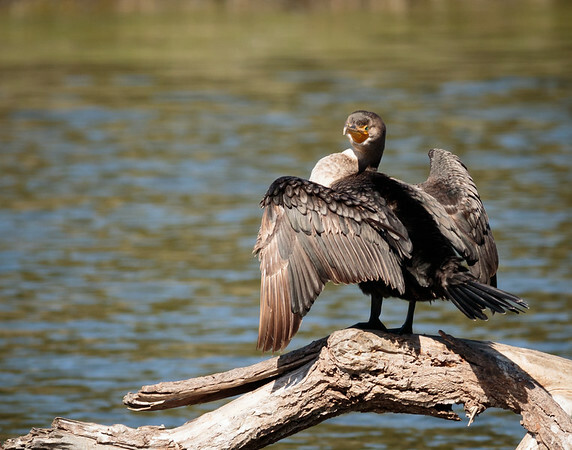 The double-crested cormorant is found near rivers and lakes and along the coastline. It mainly eats fish and hunts by swimming and diving. Its feathers, like those of all cormorants, are not waterproof and it must spend time drying them out after spending time in the water. Once threatened by the use of DDT, the numbers of this bird have increased markedly in recent years.